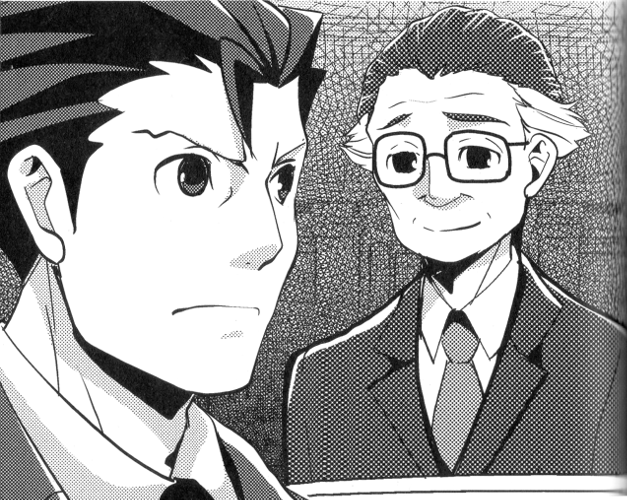 At my request, my first witness – Amamiya-san, took the witness stand. He introduced himself with his usual gentlemanly smile. He looked to me and gave a light nod. I said, and he silently nodded in reply. The judge picked an odd moment to show his admiration. Prosecutor Yuugami then spoke. Amamiya-san laughed at my suggestion. Remaining dignified to the end. I indicated on my rough sketch of the crime scene. The judge spoke. The look in Amamiya-san's eyes became grim – or at least it looks that way. The judge nodded and called a bailiff to enquire about this matter with Pegasus Town. The result was soon clear. The bailiff reported his findings to the judge. ... I knew it! Just as I thought. The sign outside the bathroom was a trick done by the culprit! Amamiya-san gave me a condescending look. It was like he was a different person from his usual gentlemanly persona. I gave a confident smile – but on the inside, I was anything but confident. This is why I'd lined up my second witness. But I can't be sure if her testimony will expose Amamiya-san's lies. And she's somewhat careless... I'm not even sure I'll get a straight testimony from her. But I've got no option other than to rely on what she has to say. The second witness took the witness stand. Isogi-san shouted in a loud voice, her expression just as excited as her words indicated. Ugh... Was it really a good idea to call her...? I'm not so sure now. I'll try sending a lifeboat. Isogi-san pulled her phone from her bag in a rush, causing her purse, make up pouch and a paperback to fall on the floor, she hastily picked everything up and finally checked her phone. – All right. Just as I'd suspected. I told Isogi-san she could leave the stand now (to her great disappointment...), and once again requested testimony from Amamiya-san. The smile had vanished from Amamiya-san's face. The confident smile returned to Amamiya-san's face. After confidently pressing for answers, I found myself lost for words. ... That's right. Amamiya-san perfectly described the pass case. Prosecutor Yuugami spoke to solidify his stance. I suddenly realised. Amamiya-san nodded in satisfaction and held up his right hand. I recall Amamiya-san awkwardly using his left hand to give me his business card, open doors, etc. ... There's no point in asking. Not if he's that confident. He elegantly brushed aside my desperate remark. Amamiya-san began removing his bandages. There was indeed a large wound beneath the bandages. There was a deep cut at the base of his thumb. There's no way he could hold anything like that. The judge covered his eyes. The judge still had his doubts. Prosecutor Yuugami's tone suddenly became kindly. What the hell is that? You can't play the grandchild card! However it seems as though the judge had been swayed. I raised my voice in a panic. The judge put down the gavel he was holding. My claim of a contradiction had been a bluff to buy time. If I'd remained silent, the verdict would have been given. I'm backed right against the wall. Calm yourself, Ryuuichi Naruhodou... If Amamiya-san is the culprit, he had to be lying. There has to be a contradiction somewhere in his words. I went back over all the details Amamiya-san had spoken about. – I was completely careless. I dropped the knife on the floor and in a panic picked it up by the blade. ... Something about that bugs me. Is there something wrong with that statement...? I'm sure I heard something similar recently. – I'm always doing that, careless really. My secretary would scold me if she knew. The bitter laugh in Amamiya-san's voice returned to my mind. I've got it. That's what's bugging me. Amamiya-san had already made a huge mistake! Amamiya-san took a moment to swallow his breath. Then continued calmly. For the first time, Amamiya-san's expression became flustered. – Alright. It was an all or nothing gamble, but it seems to have paid off. The moment he mentioned having a mop it was all over. Kokone-chan showed her admiration. Luck or not, it's time to push this door all the way open. Amamiya-san went pale. He opened his mouth slightly, but what came out was not his usual smooth voice, but a wordless groaning noise. The loud voice reverberated through the courtroom. Everyone froze in an instant. Amamiya-san immediately realised his error. He promptly cleared his throat and rephrased himself. ... Oh? He's just admitting it like that...? I enquired, somewhat taken aback. Amamiya-san had completely regained his calm and once again smiled. That's ridiculous! There's limits to how far you can push it. This is getting ridiculous. This isn't remotely plausible! However, Prosecutor Yuugami interjected. Glaring daggers at Amamiya-san. All my doubts turned to convictions. Amamiya-san is definitely suspicious. There's got to be a contradiction. But where...!? The judge grasped his gavel. If he brings it down, it's all over. He's about to render judgement on Momogaya-san...! I shouted without realising. The judge's hand stopped. It was a desperate ploy for time – it was the only thing I could come up with to keep struggling along. But I'll keep holding on for dear life. Owner Amamiya spoke with a triumphant expression. Prosecutor Yuugami added in. I nodded silently. ... Right. That's the biggest problem. If Amamiya-san is the culprit, then after committing the crime, he somehow got back to his office on the 17th floor ahead of me. 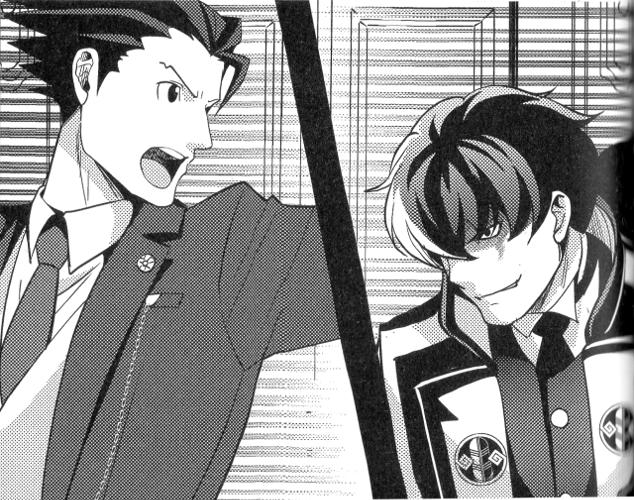 Amamiya-san simply laughed in response to Prosecutor Yuugami. Laughter spread through the gallery. He's right... Climbing to the 17th floor by the stairs is unrealistic. Some other way to return to the 17th floor before me... Does such a thing exist? I remained silent. Kokone-chan looked at me desperately. No matter how hard I think, there was no way to get up to the 17th floor before me without using the elevator. Is this the end? Am I really unable to do anything to save Momogaya-san...? No, not yet. I can't give in yet. I've been in this kind of situation before. This isn't the first or second time I've dealt with absolute desperation. I've pulled through before. – I need to turnabout my way of thinking. That's my trump card. I've overturned countless hopeless seeming situations with this method. I'll turn things around this time too. Rather than thinking about how the culprit could return to the 17th floor without using the elevator – I need to think about how he could have used the elevator! I wasn't alone in the elevator at the time. There was another person who got in the elevator with me. Right. They're the only one who could have used the elevator...! I spoke, the judge stopping his hand just before swinging his gavel. Prosecutor Yuugami gave a sarcastic smile. Amamiya-san also laughed. Commotion flooded the courtroom. The judge, seemingly having forgotten about his gavel, stared blankly. He was brought back to his senses by Amamiya-san's loud laughing voice. The judge blinked incessantly as he looked at me. I looked straight at Amamiya-san. Amamiya-san's voice became rougher as he glared at me. Amamiya-san gave up speaking and looked at me with pitiful eyes. A deep voice echoed. Prosecutor Yuugami glared at me with intense bloodlust. 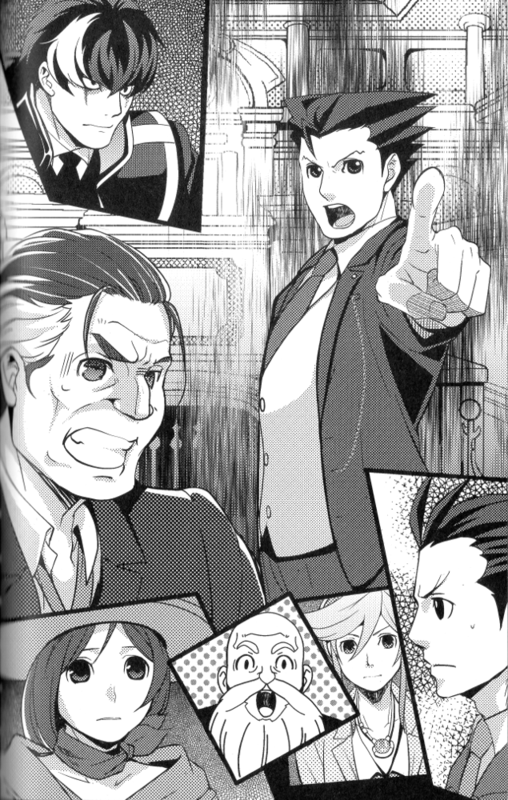 I instinctively flinched as Prosecutor Yuugami shouted. Despite just being a shout, it had the forcefulness of a slashing katana. As a result of having gotten worked up several times already, his hair and clothing were a mess. He made an attempt at regaining his gentlemanly composure, but he had a bloodshot glare in his eyes. I slammed both my hands on my desk and looked at Amamiya-san. I let out a soft sigh. Amamiya-san turned away, considering the matter settled as he began straightening his ruffled hair. The moment I said that, Amamiya-san's expression changed. The mask of a gentleman was peeled off. What I saw underneath was – a demon filled with anger and hatred, his true face. It was clear from this expression. We don't even need to check. Amamiya-san's fingerprints will not be found on the pass case. Amamiya-san went as pale as a sheet. His wide open eyes filled with anger. I pointed a finger at Amamiya-san. The courtroom suddenly became quiet enough to hear a pin drop. Nobody moved a muscle. All eyes were on Amamiya-san. Prosecutor Yuugami was silent. The uncomfortable silence focused on Amamiya-san. Amamiya-san began to tremble. His carefully prepared outward appearance of a gentleman crumbled slowly for all to see. Amamiya-san gave me an intense glare as he groaned in a rough voice. He slammed the witness stand with both hands. His outburst continued right up until the bailiffs came to subdue him. As he was dragged from the room, the courtroom returned to its silence. The judge turned his eyes to the defendant's seat and spoke solemnly. Minuki was the first to stand in the gallery. Momogaya-san lifted her face, and for the first time, gave a radiant smile befitting an idol.